Andrew Craig Brunson is accused of spying and “committing crimes on behalf of terror groups without being a member.” If found guilty, he faces up to 35 years in prison. The case has hurt relations between Turkey and the United States. The 50-year-old Brunson is an evangelical Christian. He is from the state of North Carolina. The Associated Press reports that he has lived in Turkey for 23 years and has served as the pastor of Izmir Resurrection Church. He and his wife Norine were arrested for suspected immigration violations in October 2016. Their arrests came weeks after members of Turkey’s armed forces attempted to overthrow the government. The overthrow attempt failed. More than 250 people were killed in the unrest. In the year after the overthrow attempt, the government arrested more than 40,000 people. Norine Brunson was later released. But Turkish officials expanded the charges against her husband. They accuse him of having links to the Kurdistan Workers’ Party, or PKK, which is banned in the country. 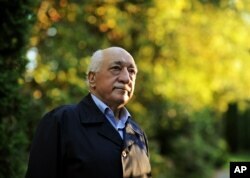 Turkey also accuses him of ties to a group led by exiled Muslim clergyman Fethullah Gulen. The government blames Gulen and his followers for the failed overthrow attempt. He denies any wrongdoing. The Turkish clergyman lives in the American state of Pennsylvania. On Monday, Andrew Brunson spoke at the beginning of his trial. He told the court “I don’t accept any of the allegations or accusations." The state-operated Anadolu news agency reported his comments. The U.S. government has repeatedly asked Turkey to release Brunson. American President Donald Trump urged President Recep Tayyip Erdogan to have his government “expeditiously” return the pastor to the United States. FILE - In this Sept. 24, 2013 file photo, Turkish Islamic preacher Fethullah Gulen is pictured at his residence in Saylorsburg, Pa. In September 2017, Turkey said it would release Brunson if the United States agreed to surrender Gulen. U.S. relations with Turkey have worsened recently over a number of issues. They include, what the U.S. government considers to be Erdogan’s expanding powers. George Grow wrote this story for VOA Learning English. His report was based on information from the Associated Press and VOANews.com. Mario Ritter was the editor.